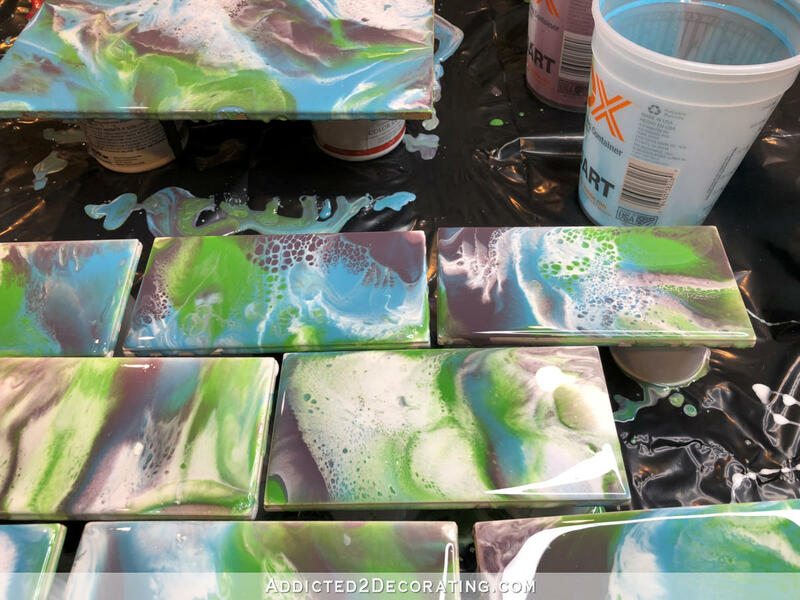 A couple of weeks ago, I showed y’all these marbled resin tiles made by an artist I follow on Instagram. At the time, I had this idea that I’d love to use those on the walls of the back entry in the studio and/or the front wall (i.e., the wall with the two windows) in the studio. Before I got started, I used four scraps of 2 x 4’s, all cut to the same length, and placed them in a square on my work table. Then I used a contractor trash bag, cut open so that it was one layer of plastic, and put it over the boards, creating an area where any resin runoff would be caught on the table and not run off of the plastic. Next, I arranged the tiles on 3-ounce plastic Solo cups in the pattern that I wanted to use them. I knew I wanted to use them in a half running bond pattern, so I tried to replicate that. It wasn’t terribly precise, but close enough. So two things I learned here: (1) Thin plastic cups aren’t strong enough to hold up the tiles, because later in the process as the heat gun is being used, they melt and crumple under the weight of the tile. That makes for a very frustrating and messy process. And (2) there’s really no need to place them in the pattern they’ll be on the wall. That was one of my biggest questions before I started. Would the pattern continue from one tile to the next? And would they need to be installed so that the pattern flows from one tile to the next? Those answers are no, and no. And I’m so glad to learn that, because it’ll make creating and installing these tiles so much easier. As usual, I used ArtResin, and I mixed up more than I thought I’d need just because I wasn’t sure what to expect. Then I separated the mixed clear resin into four different containers and tinted them with latex paint. 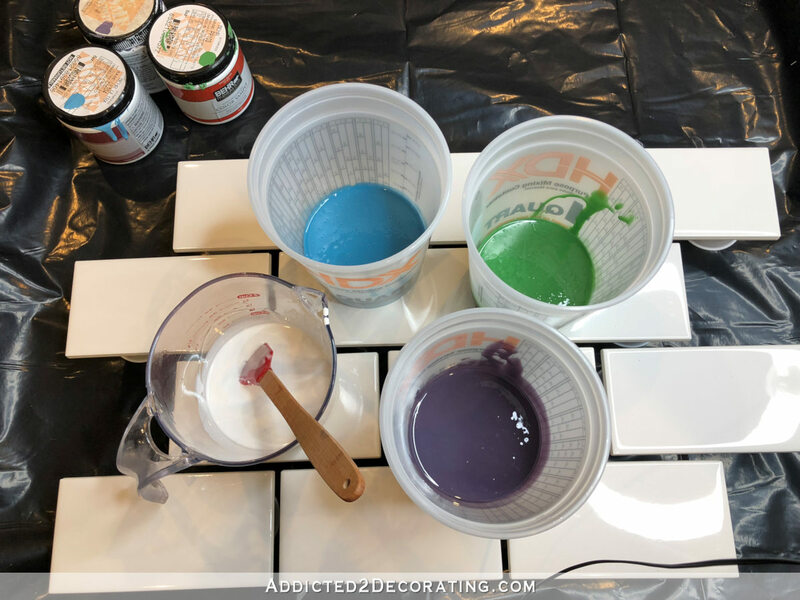 This is a perfectly acceptable way to tint resin, but you just have to be sure to read the instructions for your particular resin so that you don’t use more latex paint or any other kind of tint/additive than suggested. If you use too much, it will affect the ability of the resin to cure properly. I mixed my resin in turquoise, green, purple and white. 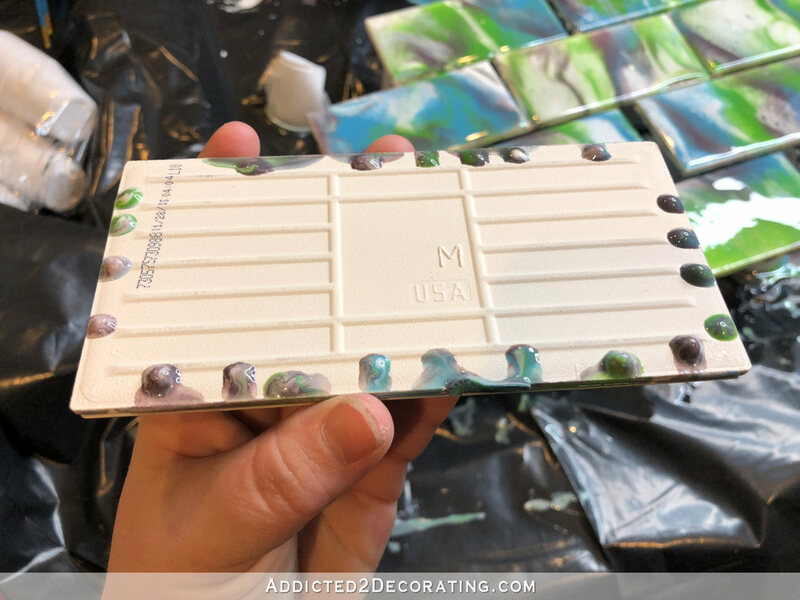 Next, I used my heat gun (click here to see the one I have) to heat the resin and make the colors mingle and marble together. And as I mentioned above, this made some of my little cups melt and crumple, which was a huge hassle. When I do the actual tiles that I’m going to use, I’ll have to find something much sturdier (preferably metal) to place them on. Here’s how they looked after I used the heat gun on all of the tiles. I had some resin left over, so I made a little piece of artwork, which you can see in the back. 🙂 I hate to waste resin. I was very pleased with how the tiles looked, but these on the back row were my favorites. The purple I used turned out looking really muddy. I’d much prefer a more vibrant purple. But other than that, I really like how my first experiment turned out. I think I can improve upon it, but this was a good start. Another lesson I learned is that the backs of the tiles need to be covered with something that can later be peeled off to remove the drips. I’ve seen some people use packing tape. Others use contact paper. I’m going to have to try out some options, because right now, I can’t imagine how either of those would stand up to the extreme heat of the heat gun that melted and crumpled the Solo cups. 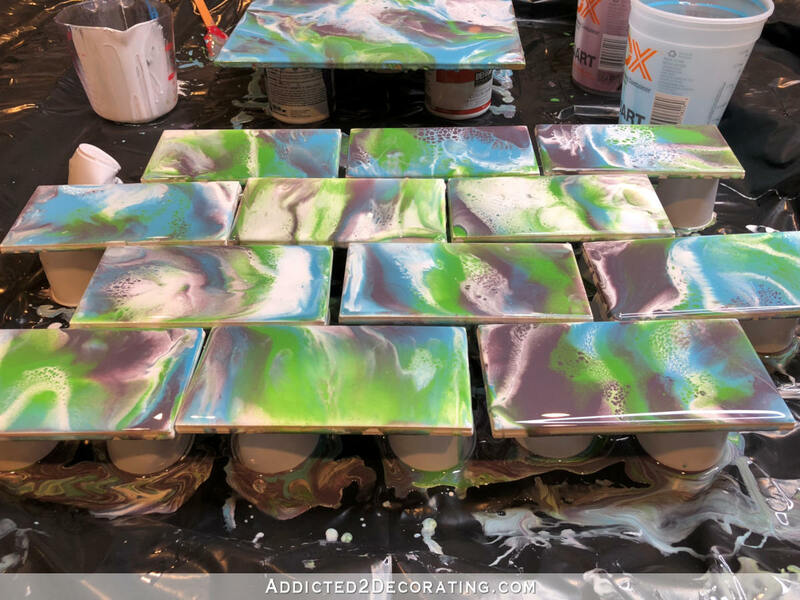 But either I have to cover the backs of the tiles before the resin is poured, or I have to cut the drips off of each of the tiles after the resin is poured. Either way, it’s going to be a huge pain, but leaving the drips isn’t an option. I’d also like to try again with using two colors plus white instead of three colors plus white. But I’d like to use two or three variations of each color. I think that would give them more interest without them being quite so busy. So I’m pretty excited about this. But after this test, I’ve realized that I probably don’t want to take on a resined tile project as large as the back studio entry walls or the front wall of the studio. And I don’t want them stuck in a tiny half bathroom, either. So as of right now, I’m planning on using them in the pantry instead. 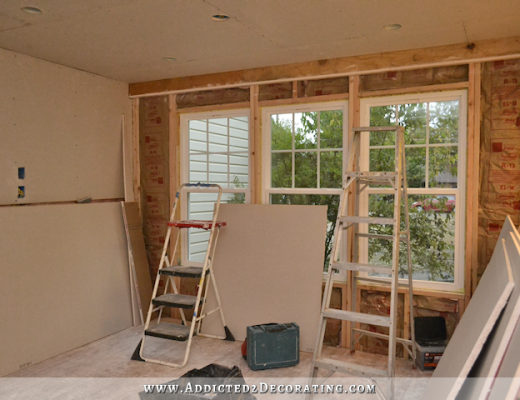 I think they’ll look so pretty through the glass of the French doors on the pantry! One thing to keep in mind, if you decide to try this, is that you need to give these tiles plenty of time to fully cure before installing them (72 hours should be enough with this brand of resin, but I’d still suggest a week), ad be sure to use unsanded grout when grouting the tiles. Sanded grout might leave fine scratches in the finish, which would be terribly discouraging after going to the trouble of making the tiles. Wowie Kazowie! Those look really pretty and a small area of your pantry will be very eye-catching. How about some 2×4’s with wax paper underneath the tiles? Wouldn’t the wax paper burn from the heat gun? I have never used it and I don’t know how easy it is to remove. Instead of solo cups, you could cut a piece of 1″ X 1″ wood into the height you need. This is the size wood that my porch balusters are made of. You read my mind Adele! 1″x 1″ wood blocks, or if you wanted, a piece of 2′ x 4″ standing on edge. That way you could use a long piece and lay many tiles along the edge. As for the drips, would that window liquid “tape” work? It goes on liquid, and dries, then peels off after you paint. Sorry, don’t know what it’s called. These tiles are so pretty! 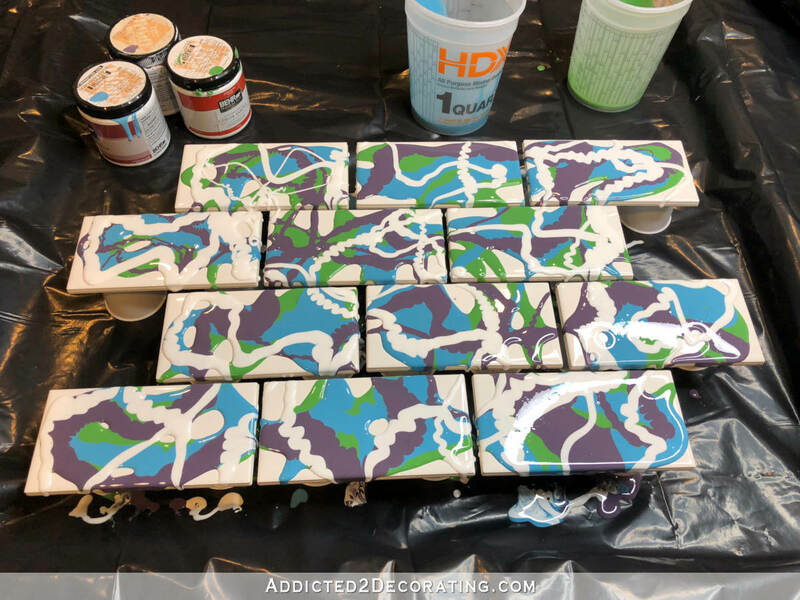 I wasn’t thinking you would do it on actual tiles, I thought you would be making them all resin! This is so much easier, and those tiles are inexpensive too. I figured if you can bake waxing or parchment paper, it would hold up? Maybe aluminum foil tape (like for HVAC ducting) would work to cover the backs of the tiles? Not sure if the adhesive would stand up to the heat but the foil itself probably would. Kristi, welcome to the world of Evil Enablers! You’ve pretty much convinced me that I’ve got to learn to play with resin and paint! More shopping! More supplies! Those tiles are glorious, even with the rather gray-ish purple. Matt, Evil Enablers is a joking term for those of us who encourage other to get hooked on our hobbies, and to acquire all of the goodies that go along with said hobbies! It’s meant to be silly, not rude or insulting! Hope it’s ok! These are so cool! I like the look of them even before the heat gun! My first thought for what to use to prop up the tiles were bricks. It will withstand the heat. When you mentioned something metal, I thought that might get hot when you use the heat gun and god forbid you touch it, you could burn yourself. 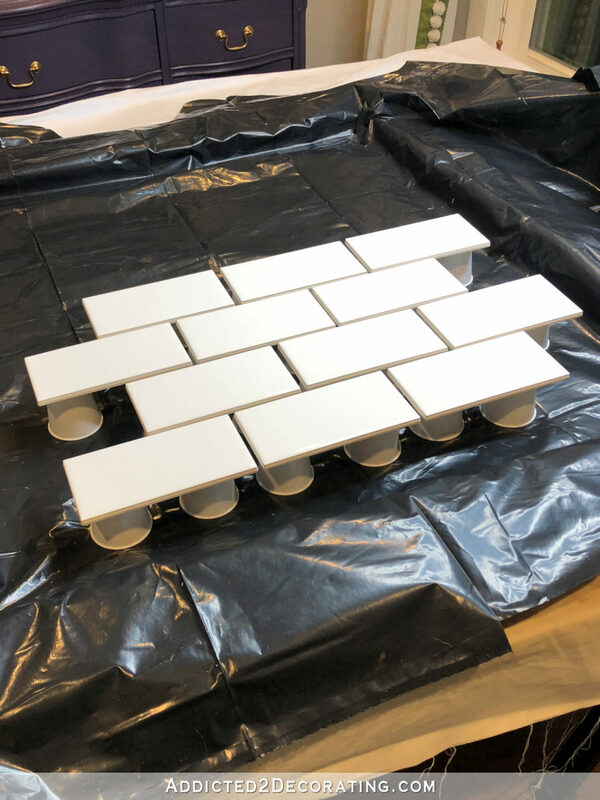 Plus the tile size and the brick size might be close enough, that when you place the tile on top of the bricks it would prevent any drips from going underneath the tiles. I love the tile idea. So colorful and creative. The resin is also a great adhesive. Tile would be permanently adhered to the bricks. The best idea is nice wide painters tape around the underneath edge. The tick is to peel the tape off along with the drips before the resin has fully set but hardened enough to not hold fingerprints. Once it has fully set it is difficult to remove the tape. While still flexible (and that will vary depending upon the brand of resin used) it is easy to pull off tape, drips and all. Also, rather than a heat gun, you could use a hair dryer to move the resin around or save the supports from melting. An other option for a support is silicone muffin cups. Do you have any left over rebar from your concrete pour? Maybe placing tiles on top of rebar would work instead of cups. 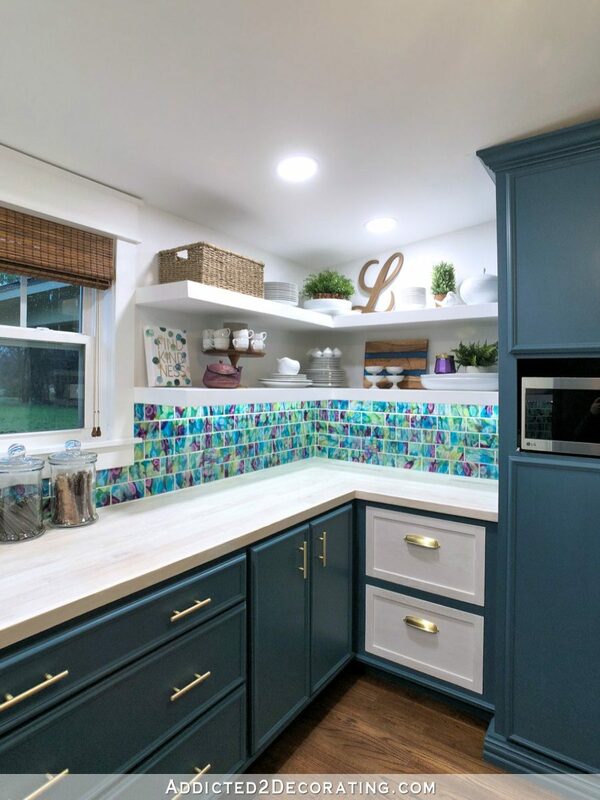 I think the tiles are really pretty and such a good idea to use in the pantry! 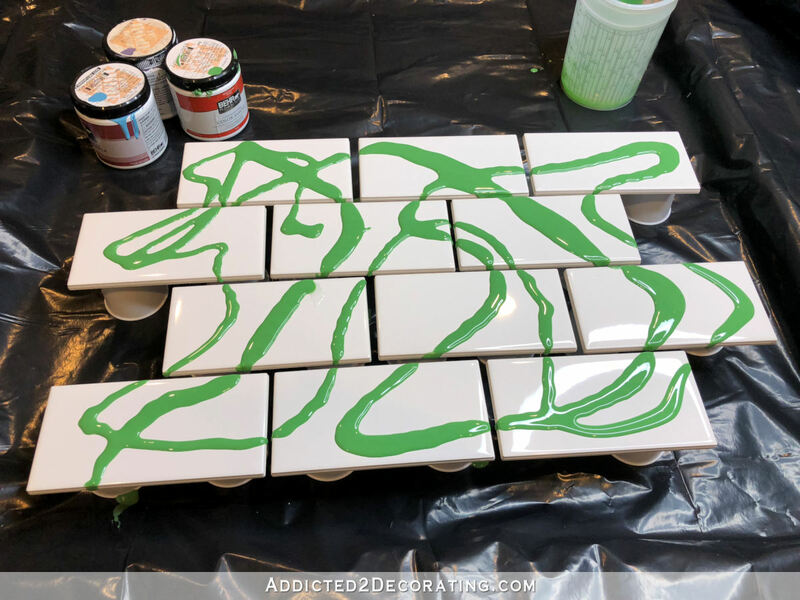 Hi Kristi, I would suggest to hold the tiles in a thin layer of plaster of Paris which can be easily broken to release the ceramic tiles when you are finished. or make a cornflour&silicone “dough” , maybe with some babypowder so that the tile doesnt stick to it. Either should withstand the heat from the heatgun. I love to follow you. Thank you for sharing your ideas and processes. Love the tiles. Why don’t you try rubbing the backs on sandpaper placed face up on your work surface. That way you can sand the nubs flush with the lines on the back of your tiles and then just apply them with thinset as usual. Should be an easy fix! If you like that sharp, defined color mix, have you thought about using alcohol inks and then putting clear resin over that? 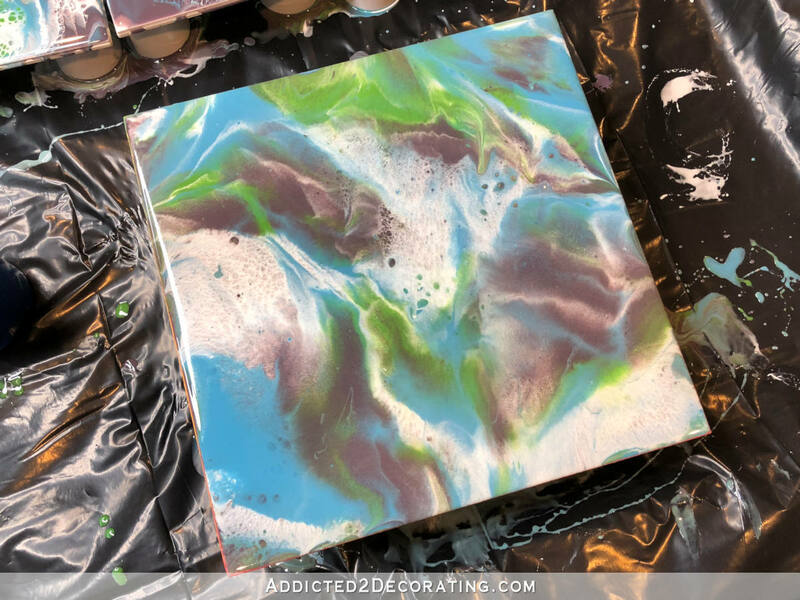 I think you can also use the alcohol inks on glossy tiles and it becomes permanent, hence no need to use resin. Don’t quote me on that, though. 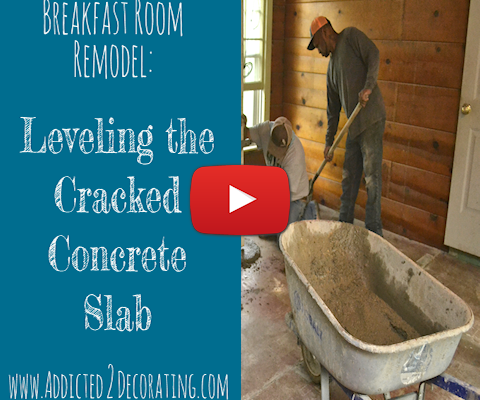 I imagine this process is very trial and error, and I think your first try is pretty amazing! As soon as I saw these I thought “How beautiful for her little jewel box of a pantry!” Totally works with the crystal ceiling light and the glass doors! Love this. My husband loves to work with resin. Can’t wait to show him these! Those are gorgeous! Kristi….try the alcohol inks! Also the big square one you did….could you put cork on the back and use it as a hot pad for your table? This type of resin isn’t really good for hot pads. I think there may be others that can be used like that (maybe), but this particular one is made specifically by and for artists to dry clear and not yellow over time, so it has less fillers and hardeners in it than a lot of other resin brands do. Consider rebar chairs to hold your tiles up. HDepot @ apprx $25/ pk of 50. I don’t know if you can buy by the each. I know they are strong bc they will bear weight of crossed rebar. I do not know their heat resistance. Thanks for posting all your thoughts, processes, and hard work. Baking racks for cooling cakes instead of plastic cups. Goodwill trip. Perhaps these would even facilitate a little pre-cleaning by lifting up and making a quick wipe before it hardens? I would imagine a little dripping on the back would be OK since it’s going into thin set. Baking or oven racks was the idea I was thinking too. And then if paint drips are still a problem on the back….. what about using a similar technique like seen when polishing finger nails where the messy polish peels easily off the skin. Are there particular colors that tend to dry more true to their wet color? Those that dry more off wet color? Given that you have been using vibrant colors I get your concern about colors. Matching isn’t necessary but projecting the same energy is nice. My experience is that any time you use acrylic paint, you can expect it to be a touch darker when dry than it is when wet. I’ve noticed that darker colors seem to have the biggest difference between wet and dry, but that might also depend on the brand of paint. I haven’t had enough experience with a wide variety of brands to know if that holds true with all of them, but it has been my experience with Behr. I thought that using the acrylic mixed with resin might keep the colors bright since it still has that shiny wet look even when dry, but that certainly wasn’t the case with the purple. Although the purple wasn’t a vibrant purple to begin with, but it was certainly brighter than what I ended up with. The resin itself didn’t have any effect on the color. Once I mixed the paint into the resin really well, it looked the same color that it looked inside the little sample pot of paint. Have you tried artist acrylics – I wonder if they might keep their color definition better (I didn’t want to use the word better, really). Even the small bottles you buy at the craft places. I’ve seen them use those and the expensive acrylics equally but not the paints like Behr. So many great ideas! I like the alcohol ink idea as it might get you the color intensity you are looking for. Believe it or not, you might want to experiment with masking tape. My dad was a body and fender repairman and often welded fenders that were masked off. As long as the flame didn’t touch the tape, it was fine after it cooled off. I don’t know if the newer tapes react that way but it can’t hurt to try it. Your tiles look great! 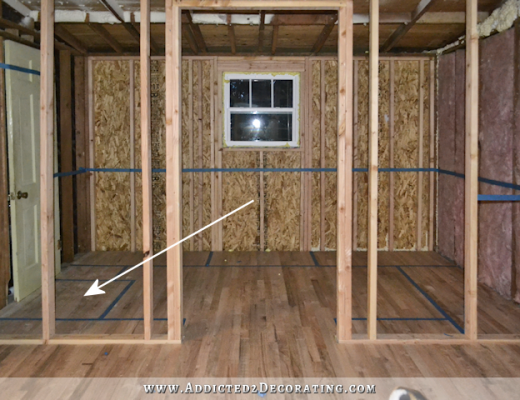 This is off topic, but looking at the previous posts of the kitchen, where is the refrigerator from? It looks awesome and I love your teal kitchen. My appliances are the GE Artistry line, but I don’t think they make them anymore. I think this is just brilliant! Actually, I thought of the wood block idea, too. Not sure how to cover the back of the tiles but I wonder if using some sort of masking liquid would work? Maybe something that potters use when they’re firing clay. Now if I could just find a place to use this idea! I’m thinking of making trivets or coasters for gifts. What a cool idea! Can’t wait to see it in place. 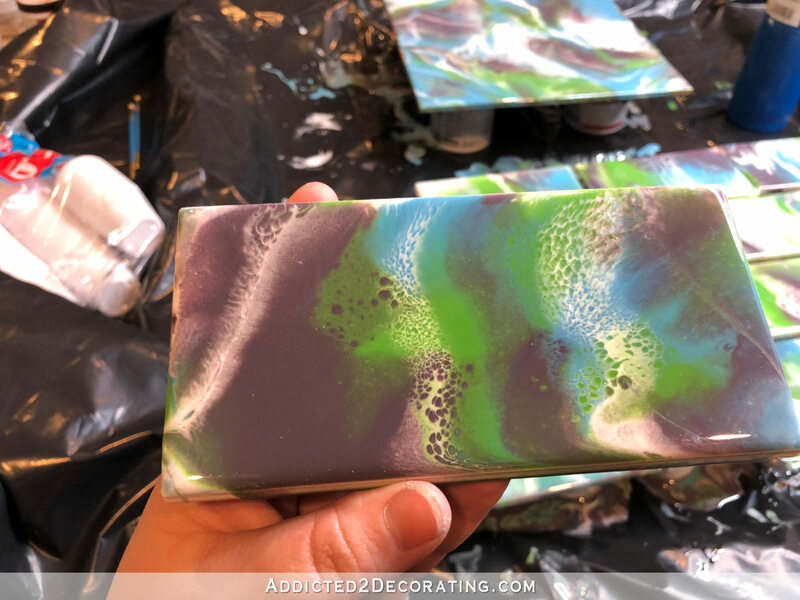 Sorry if you’ve addressed this before, but can you use metallic/glitter colors with this style, or do they not work with the resin? 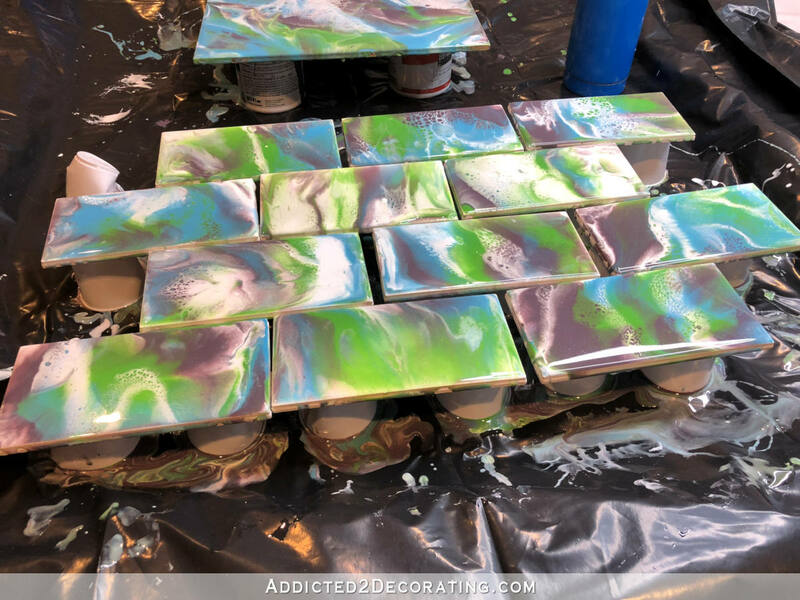 It would be so pretty in tiles or coasters if it worked right! So I would just use tin cans (from beans, vegetables, etc) to put the tiles on. Just recycle when you’re done!